The North Rockland (Thiells, NY) junior, the ’17–18 school year’s Gatorade award winner in track, added her second such honor as a prep harrier. Check out the video below. 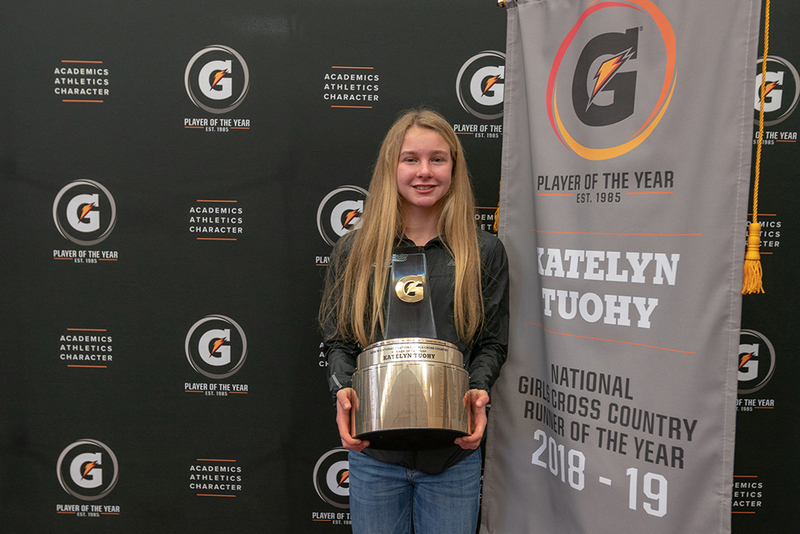 (Press Release) Thursday, February 7 – In its 34th year of honoring the nation’s most elite high school athletes, The Gatorade Company today announced Katelyn Tuohy of North Rockland High School in Thiells, N.Y. as the 2018-19 Gatorade National Girls Cross Country Runner of the Year. This is Katelyn’s fourth national Gatorade Player of the Year award. Katelyn received her second Gatorade National Girls Cross Country Runner of the Year trophy during a special presentation in her school’s library in front of teammates, friends, family and coaches. The award, which recognizes not only outstanding athletic excellence, but also high standards of academic achievement and exemplary character demonstrated on and off the field, distinguishes Tuohy as the nation’s best high school girls cross country runner (see below for full list of previous winners). The 5-foot-4 junior raced to her second consecutive Nike Cross Nationals championship this past season, breaking her own course record by clocking a 16:37.8. The 2018 Gatorade Female High School Athlete of the Year, Tuohy also won the Class A individual state championship in 17:02.1 and finished first at the NXN New York Regional championships in 17:14. Unbeaten for the second consecutive season, Tuohy hasn’t lost an outdoors 5K since December of 2016. The reigning Gatorade National Cross Country Runner of the Year and 2017-18 Gatorade National Track & Field Athlete of the Year, she also broke the tape first at the Section 1 championships, the Rockland County championships, the Shore Coaches Invitational and the Suffolk Officials Invitational this past fall. She has volunteered locally on behalf of youth soccer and running programs, as well as the Rose Memorial Library. 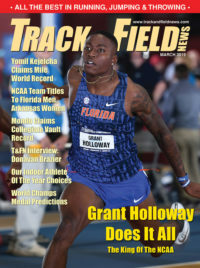 A national advisory panel comprised of sport-specific experts and sports journalists helped select Tuohy from thousands of high school cross country runners nationwide. Tuohy, the reigning Gatorade Female Athlete of the Year is now a finalist to win the most prestigious award in high school sports for the second time, which will be announced at a special ceremony prior to The ESPY Awards in July.